"Robert's message of inspiration is backed by solidly practical guides, studies, tools and detailed experience. We immediately put some of his story mapping practices in place, and they have not only been embraced, but become a key component to our marketing planning processes." 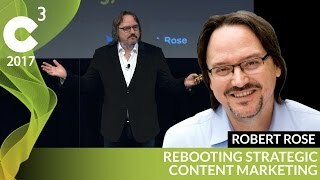 "Robert led a content marketing session for our team which was, by far and away, the best part of our 3 day conference. He was an amazing facilitator, bringing together insightful frameworks and exercises that taught us how to implement that content he was teaching. Our team still talks about the lessons we learned."